Schematic Design Phase includes the preparation and submission of sketch design drawings (free-hand) for the clients. This design phase is of benefit to the client as it allows for a quick process to develop alternatives design concepts. The preferred alternative is then developed in the next design phase. This design phase may include sketch - perspectives, sections and mood board. Preliminary Design Phase consists of the preparation and submission of presentation drawings (free-hand/ auto-cad) of the preferred concept. 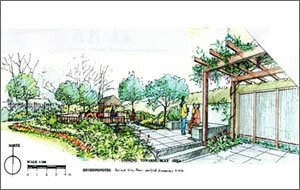 This design phase is of benefit to the client as it illustrates with clarity the landscape design concept. In-house cost estimates can be developed, providing a landscape budget prior to proceeding with working drawings. 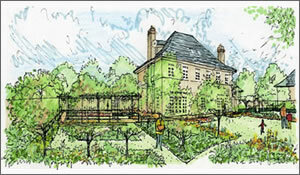 This design phase may include sections and selection of materials and plants for the proposed scheme. The Final Design Phase involves the preparation and submission of working drawings (auto-cad) and contract documents for the clients. This design phase is of benefit to the client as it provides a tender package for landscape contractors to implement the proposed landscape and the required information for a planning submission. Detail design includes construction drawings, grading, layout / material and planting plans, bill of quantities, costing, plant schedule, planting specifications and a maintenance programme. Tender Design Phase includes invitation for tenders and is of benefit to the client as it provides comparative quotations from the contract documents prior to construction and planting. On-site Implementation Design Phase provides the landscape architect the means to implement the proposed design scheme on-site by site inspections, liaison with the appointed landscape contractor and client. This is beneficial to the client as it is a vital process to maintain adherence of the landscape contract documents and control of workmanship and planting quality.